Successful email marketing is not about asking people to sign up and sending them promotional emails till they unsubscribe. It is a great opportunity to build unique relationships between your brand and subscribers. 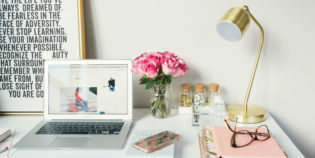 If you want to make the best of your email marketing, change your mindset and think of the subscription process as a journey to becoming a loyal enthusiast of your brand. This way you become a guide – your role is to look after your subscribers and help them move through subsequent stages of that journey. Make sure they are entertained and arrive safely at the intended destination. We wanted to make your job a little bit easier and equip you with a map – an email marketing funnel, which is a graphic representation of a subscription process. Use it for planning the best route, mark all the attractions on the way, and check if everyone is heading in the right direction. Effective email marketing is not a one-step process. It is an adventure that starts with filling out a sign-up form and continues through different phases of building a relationship. If you want to engage your audience and make the most of your actions, you need to recognize and address different subscriber’s needs at certain stages. Eventually your subscribers become satisfied customers, obviously making a purchase is not the final destination. The journey goes on so you get a chance to retain delighted customers and turn them into brand advocates. The answers will help you start off with a proper mindset and come up with interesting and useful content ideas. What is the reason for anyone to subscribe to your mailing list? What do you offer in return for an email address? Does your email bring value or is it merely another way to promote the same content as across all your social media profiles. Incentivize users to join your email marketing by offering unique content and special offers. Give them something that might not be found anywhere else. This way you will appreciate your subscribers’ trust, keep them interested for longer, and provide them a reason for promoting your content. Let’s face it. The main role of an email marketing strategy is to help meet business goals. You need to know exactly where you business goes and align the email marketing strategy accordingly. Relationships with customers differ from company to company. Your subscriber’s journey doesn’t need to be as long as in our template. You should use data and adjust it to your business reality. Analyze your business model, determine your business goals, and align your email marketing strategy accordingly. Decide what you want to achieve and plan email marketing campaigns that will help you reach business goals. Avoid planning too many tasks – focus on the core activities without the risk of getting overwhelmed by too many things on you to-do list and compromising quality. A fragment from the Unfollow Algorithm survey by BuzzStream and Fractl. The funnel will allow you to see the specific needs at each stage of the subscription. You will be able to focus on preparing the right content at the right time. By sending relevant messages to your audience, you will increase the overall effectiveness of your email marketing campaigns and reduce email marketing list churn rate. You can use the email marketing funnel to determine the right key performance indicators – measurable values that demonstrates how effectively you achieve key objectives. 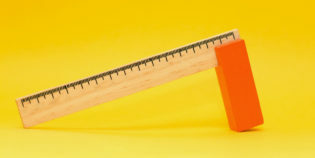 The clear structure of a funnel helps with aligning proper KPIs with each segment. Take a look at your funnel and decide whether it’s the number of subscribers, click-through rate, number of downloads or return on investment that you want to measure. Do you use email marketing funnel to support your email marketing strategy? 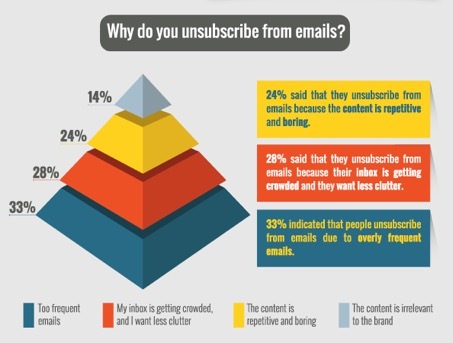 Does it help with planning your email marketing campaigns? Leave a comment! 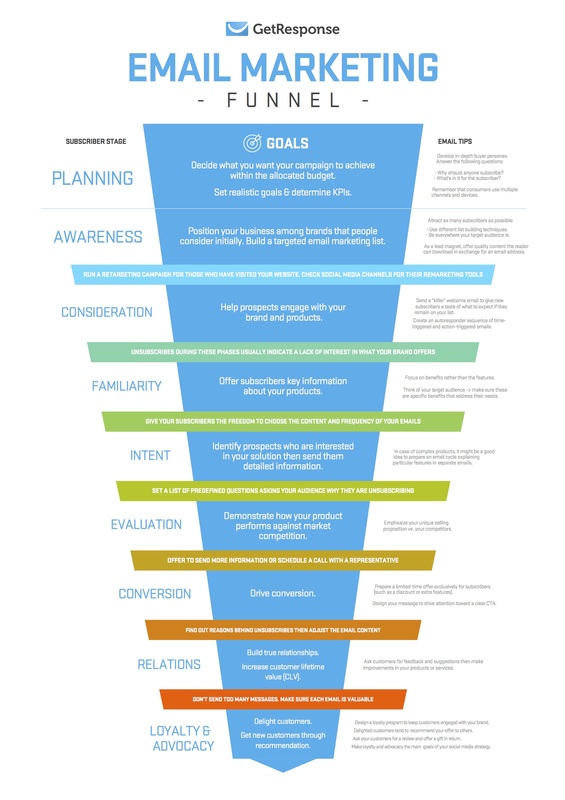 Download your PDF copy of our Email Marketing Funnel. Print it, tape it to your wall, be inspired by it!